How to create a Lesson using the Multichoice Questions: Type 2 Component? Multichoice Questions: Type 2 component can be used to test the learner's level of knowledge on a given topic. You can use this component to create 4 types of questions. Multichoice Questions: Type 2 component can be used for testing well-defined skills related to a certain topic. It can be an effective assessment tool. This component will be very helpful when you want the users select answers for the questions provided in an interactive manner. The question might have a single or multiple correct answers. User selects answer(s) and clicks the Submit button to submit the answer(s). If the user has selected the correct answer(s), it will be highlighted in green. If the user has selected any wrong answer(s), it will be highlighted in red. The Submit button changes to Retry button and the user clicks it. It turns back to Submit. The user again selects answer(s) and clicks the Submit button to submit the answer(s). If the user has selected the correct answer(s), it will be highlighted in green. If he/she has selected any wrong answer(s), it will be highlighted in red. 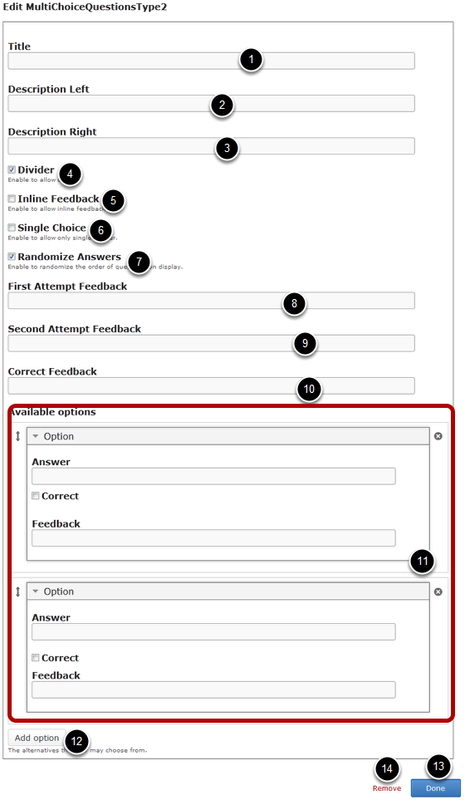 Feedbacks may appear at each attempt at the row level next to the answers or at the overall level on the grey panel at the bottom of the page. Then click on the Multichoice question: Type 2 component icon as shown in the above image. You will see a screen similar to the image shown below. Add the description text or contents on the Description Left  and Description Right fields. These contents will appear on the left and right sides of the description part respectively. Please note that the Description Right field is optional. Add an optional divider between Description text and answers by clicking the Divider  checkbox. 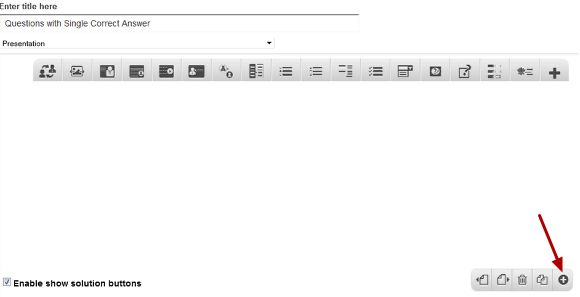 Enable the inline feed back by clicking on the Inline Feed Back  checkbox. Enable single answer only by clicking on the Single Choice  checkbox. Add text to the First Attempt Feedback, Second Attempt Feedback  and Correct Feedback  fields. Please note that these 3 fields are optional. Add multiple answers in Available options field. You can add the answers under the Option title. Add more alternative options by clicking on the Add option  button. Once you’ve added the component, you can create a question of any of the 4 types mentioned earlier. You can check the documens for these types of components to learn how to create a question of these types individually.